You’ll find our retreat rates are very affordable compared to traditional spa resorts in the Northeast because we see health as a necessity for all, not a luxury for some. 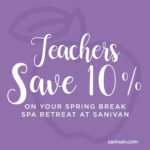 We invite you to visit Sanivan and take advantage of these special offers and events. Please note, we can only honor one offer at a time. Visit Sanivan with 2 other friends or family members and you will each receive 15% off your 2 night stay. This offer applies to a total of 3 guests occupying 3 single rooms and cannot be combined with other specials. Dates: Valid anytime between March 21, 2019-June 31, 2019.